Rising consumer out-of-pocket (OOP) healthcare spending also impacts hospitals, life sciences companies and health plans, according to Deloitte’s Center for Health Solutions. Government data shows rising OOP spending for consumers, but excludes some types of health-related items and services that can add significantly to the total amount and consumer share of spending. This infographic exposes these “hidden costs” that account for almost one-fifth of total health care spending. Case studies of two insurers that have developed bundled payment systems to reimburse providers for several episodes, including total joint replacements, congestive heart failure and colonoscopy. 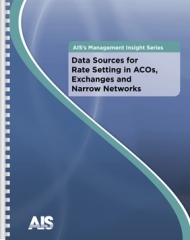 From how the payers got started to the pitfalls they encountered and the latest financial and quality outcomes seen, this report walks through the entire process of building a bundled payment system. 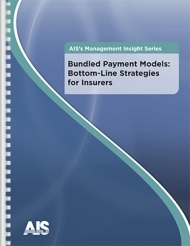 Bundled Payment Models: Bottom-Line Strategies for Insurers provides the details of how two insurers — Horizon Healthcare Services, Inc. and Arkansas Blue Cross and Blue Shield — developed successful programs to reimburse providers for episodes of care, combining payments for all aspects of treatment rather than paying providers individually for tests, office visits and procedures. Healthcare analytics has the potential to provide the insight to help reduce operational costs, optimize IT systems and help clinicians make the best decisions for their patients. The following infographic produced by Dimensional Insight, “3 Cornerstones for Healthcare Analytics Success,” shows three areas that healthcare organizations must consider when looking at analytics solutions. Increased transparency in the healthcare industry will change how providers compete in the marketplace, according to a new infographic from the Patient-to-Consumer Revolution. Health plans will either enable transparent consumer shopping, or be by-passed by a consumer technology company that will offer this type of comparison shopping. Beginning January 2015, Medicare will pay a flat, monthly chronic care management (CCM) fee to providers coordinating care for beneficiaries with more than one chronic condition. This change will expand the current Medicare payment policy to include non face-to-face management services previously included within payments for evaluation and management (EM) services, amount to about $40 a beneficiary, a sizeable new source of revenue for eligible providers. The targeted population is also substantial; as recent news story reported by the Healthcare Intelligence Network (HIN), 87 percent of U.S. adults ages 65 and older have at least one chronic illness, and 68 percent have two or more, the highest rates in a new 11-country Commonwealth Fund survey. But healthcare organizations do not have that much time to prepare for the newly released 2015 Medicare Physician Fee schedule, which finalized the CCM reimbursement. Who can bill for CCM, what constitutes a chronic condition, which patients are eligible to receive CCM services, and the scope of services required were among the issues discussed during Chronic Care Management Medicare Reimbursement: New Revenue Opportunities for Care Coordination, a November 19th webinar, now available for replay. Rick Hindmand, an attorney with McDonald Hopkins, a law firm that advises a nationwide client base extensively on healthcare reimbursement, shared insight on these issues and how to best prepare for this reimbursement opportunity. Those allowed to bill for CCM reimbursement fall into one of five categories: physicians, advanced practice registered nurses (APRNs), physician assistants (PAs), clinical nurse specialists and certified nurse midwives. If these practitioners are part of a practice entity, that entity can bill for it as well. Beneficiary requirements are not as clear cut, Mr. Hindman continued. Eligible patients must have at least two chronic conditions that are expected to last at least 12 months or until death, and those conditions need to create a significant risk of death, acute exacerbation/decomposition or functional decline. Specific definitions of conditions can be found at CMS’s Web site. And because CMS does not want to pay for duplicative services, CCM is not allowed for beneficiaries who receive services for transitional care management, home healthcare supervision, hospice supervision, and various end stage renal disease (ESRD) conditions. Patients attributed under the Multi-payer Advanced Primary Care Practice Demonstration (MAPCP) and the Comprehensive Primary Care (CPC) Initiative are also excluded. Once these requirements are satisfied, providers must offer and document 20 minutes of CCM services a month, which enhance access and continuity of care, care management, transition management, and coordination, Mr. Hindman continues. The CCM fee comes to about $40 a beneficiary, a significant revenue source once applied to all patients within a practice. Why the change now? Mr. Hindman speculates that CMS is finally realizing that care management is a crucial component of primary care. But questions and details await future guidance from CMS, and satisfying and documenting compliance with the CCM reimbursement requirements is going to present a challenge for many practices. To listen to an interview with Mr. Hindman, click here. Under CMS’ new Chronic Care Management (CCM) program, which takes effect in 2015, physician practices can receive reimbursement for non-encounter based follow up care to coordinate care for those with chronic conditions. A new infographic by HealthFusion provides details on the physician practice and patient responsibilities for practices to be eligible for this reimbursement. Starting January 2015, physician practices will be eligible to receive reimbursement for chronic care management services provided by physicians, advanced practice nurses, physician assistants, clinical nurse specialists and certified midwives to Medicare beneficiaries with multiple chronic conditions. The 2015 Medicare Physician Fee schedule, which finalized the Chronic Care Management reimbursement, was just released, leaving healthcare organizations with little time to prepare for the final aspects of this new reimbursement opportunity. During Chronic Care Management Medicare Reimbursement: New Revenue Opportunities for Care Coordination a November 19th webinar, now available for replay, Rick Hindmand, attorney with McDonald Hopkins, will share critical insight into how physician practices can best structure their practice to receive this additional reimbursement. The McDonald Hopkins law firm advises a nation-wide client base extensively on healthcare reimbursement. Providers are moving into payor spaces, assuming care coordination roles. Payors are expanding into provider businesses. Hospitals are being repurposed as post-acute care centers. Empowered consumers are diving into data analytics for cost and quality information. Innovators launching new care models abroad are poised to test them on U.S. soil, turning healthcare into a global market. Given these role reversals and emerging players, the challenge of distinguishing oneself organizationally in the marketplace is a formidable one. Healthcare payors and providers received targeted advice for achieving this goal during Healthcare Trends and Forecasts 2015: A Strategic Planning Session. And as Dorothy Moller, a managing director at Navigant, and Steven Valentine, president of The Camden Group, both attested to during the eleventh annual planning session from the Healthcare Intelligence Network, the biggest threat may come from outside the industry. Within the marketplace, Vivity, Anthem Blue Cross’s new, low-cost, patient-centered Southern California health plan that targets employers, is challenging Kaiser Health Plan for market share, added Valentine. Similarly, health plans are also threatened by ‘disintermediation,’ offered Ms. Moller the movement of payors out of the value exchange, such as in the case of direct primary care. Both thought leaders analyzed factors driving healthcare change, including the steady shift toward value-based reimbursement, changing healthcare delivery models and the increasing reliance on remote patient monitoring, then outlined areas ripe for potential innovation and growth. While each proposed sector-specific coping strategies, payor-provider integration, collaboration and partnerships were also strongly encouraged. Pressure for increased transparency also is taking its toll, with myriad sites and sources offering healthcare cost and quality data. “Healthcare systems can look at their competitors. They can get a sense of pricing in their market,” said Valentine, who advised providers to focus on pricing now in anticipation of increased awareness by 2016 and 2017, when he expects more states to include claims and pricing in exchanges. Ms. Moller advises payors to proceed carefully when considering new development. Her suggestions include collaborations with non-traditional industries, conducting long-term strategizing, and monitoring the global market. In the closing Q&A, Ms. Moller and Mr. Valentine addressed more 2015 concerns, including the anticipated impact of Chronic Care Management reimbursement. Hospice and palliative care will likely be affected by the updated 2015 Physician Medicare Fee Schedule, predicted Valentine, who views chronic care management as a critical focus for healthcare providers in the year ahead. Commenting on impact from the numbers of newly insured on the system, Ms. Moller responded it is still too early to see the true effect, due to slow implementation and a claims lag. For more provider predictions from Steven Valentine, including a surge in telehealth, e-visits and physician-hospital organizations, click here. To listen to Ms. Moller’s expectations for payors in the year ahead, including co-located care management and progress by safety net payors, click here. Have predictions of your own? Our 10 Questions on 2015 Healthcare Trends Survey runs through December 13. 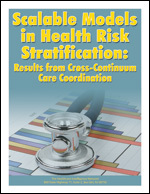 One winner who completes the survey will be eligible to win an on-demand recording of the 2015 strategic healthcare planning session described in this post. 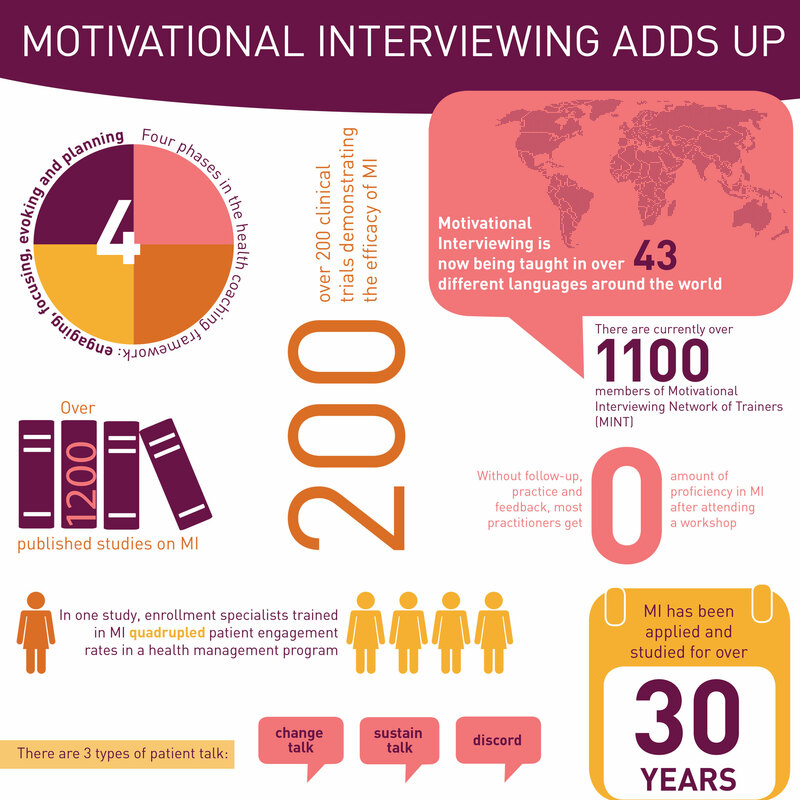 Motivational interviewing (MI) is a standardized, evidence-based approach for facilitating behavior change, according to a new infographic by Health Sciences Institute. The infographic explores the four key phases of MI and evidence to support MI’s impact. To succeed in a value-driven system, healthcare organizations will need to shift primary responsibility for health management to the individuals it serves. Evidence-based health coaching supports these population health goals by aligning best practice care with patients’ needs and values. Evidence-Based Health Coaching: Patient-Centered Competencies for Population Health presents a template for evidence-based coaching that emphasizes clinical competencies, along with real-life applications from a health system already utilizing clinical health coaches within its value-based healthcare network. In nine separate pilots of remote patient monitoring, Humana is testing technologies to keep the frail elderly safe and healthy within their homes for as long as possible. Here, Gail Miller, vice president of telephonic clinical operations in Humana’s care management organization, Humana Cares/SeniorBridge, reviews some of the tools and challenges of remote care management of individuals experiencing difficulties with activities of daily living (ADL). Question: What assessment tools do you use to measure functional limitations and ADLs? (Gail Miller): Besides the Charleston Frailty Index, we have a proprietarily developed tool that was started with Green Ribbon Health that manages all of the functional capabilities. That is the one that we use to help scale people. We also use the PH12 and the Subjective Global Assessment (SGA), as well as a couple of other assessment tools. It will often depend on how the person is presenting, but our primary assessment tool for functionality is the mDAT, which we developed internally. Question: How does Humana define ‘frail’? (Gail Miller): We use the clinical definition of frail — people more likely to fall, unable to keep their balance, on various medications, etc. Question: How do you coordinate care for the functionally challenged? (Gail Miller): If someone is having problems falling in their home, we will send our care managers into the home to do a fall and safety assessment, and then we will work with that member to complete the actions on the plan and to try and make their home safer for them to be able to move around in. If the person is having issues with their balance for example, and it isn’t due to the construction of their home or the way items are placed there, then we will get them to the appropriate provider so that they can be assessed, and see if there are things that we can do to improve on that. In that case, we would not only be taking them to one of our providers, but also getting them enrolled in one of our Silver Sneakers classes, which is a class we offer that focuses specifically on balance and core strengths. Gail Miller is vice president of clinical telephonic operations for Humana Cares, the complex care and chronic management arm of Humana, Inc. Her responsibilities include the oversight of the complex and chronic care programs provided telephonically to members of Humana. Traditional IT adoption models such as building solutions from the ground up and/or sourcing third party services results in inefficiency, complexity and unpredictability, according to a new infographic by Infosys. The infographic examines the benefits of a platform-based approach to health IT. Although the standards in electronic health records and general healthcare services continue to evolve, many organizations push to connect interoperability with public service and basic citizenship rights. This poses significant technical and organizational challenges that are the focus of many research and standardization efforts. Interoperability in Healthcare Information Systems: Standards, Management and Technology provides a comprehensive collection on the overview of electronic health records and health services interoperability and the different aspects representing its outlook in a framework that is useful for practitioners, researchers, and decision-makers.